An alternative or enhancement to hearing aids can include Assistive Listening Devices. Hearing may not provide clear hearing for everybody under demanding environments. Background noise at work and social environments can limit the effectiveness of hearing aids, and other technologies like phones and TVs occasionally need different technologies. There are some effective listening devices that can add clarity to these everyday situations. Telephone devices amplify the ring of the telephone and have a volume control to increase the loudness of the incoming voice. Induction loops minimise background noise and improve the clarity of incoming voice. Induction loops TTY (teletypewriters) are text-based devices enabling people with a severe or profound hearing loss to communicate via the telephone line. Various options are available to enhance the signal from your TV to help you enjoy it with or without hearing aids. Bluetooth streamers collect signal from your TV, convert it to Bluetooth and send it to a wireless bluetooth receiver that is worn around the neck. Earphones or headphones plug directly into TVs to make hearing the TV signal more direct and clearer. These are best for watching TV alone. Television amplifiers can be used with or without hearing aids and do not require an earphone socket. They do not affect the volume of the TV when others are watching. A small microphone is attached to the TV speaker using velcro and is connected by a wire to a set of earphones or to a neckloop that transmits the signal to your hearing aid. Induction loops for hearing aid wearers eliminate background noise and improve the clarity of sound. 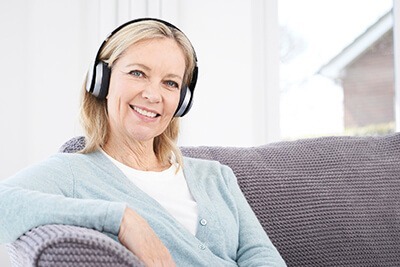 Neckloop devices are used in conjunction with the telecoil on hearing aids and transmit sound from the TV to the induction coil in the hearing aid. Infrared and radio systems, with no cords to trip on, transmit signal to a receiver worn around the neck. The system can be connected to headphones or to an induction loop for use with or without a hearing aid. An infrared system can be coupled to a TV, radio and stereo simultaneously. The listener can move from one to the other without having to reconnect. Teletext decoders are built into TVs. Bluetooth streamers collect signal from your music device and send it to a wireless bluetooth receiver that is worn around the neck. Some modern hearing aids can receive music directly from a bluetooth device without the need for a streamer/interface. Induction loops can also be used to listen to personal stereos, iPods or MP3 players. Alerts for the door (e.g. vibration, amplifiers or a flashing light) indicate someone is at the door. An extra loud sounder for the phone warns you about incoming calls. Vibrating devices are commonly used to wake people in the morning. Safety – a remote control flashing signaller indicates that there is smoke in the house.